PRO: Re-signed with the Riders in March, 2017…signed with the Riders in May, 2015…CFL rights acquired by the Riders from the Edmonton Eskimos on May 11, 2015…signed with the Kansas City Chiefs in January, 2015…claimed by the St. Louis Rams in May, 2014…signed with the Seattle Seahawks in April, 2014…signed with the St. Louis Rams in April, 2013…selected by Edmonton in the 4th round (31st overall) of the 2013 CFL Draft. 2018: Played 18 regular-season games and the Western Semi-Final as the team’s long and short snapper…had a career-high eight special-teams tackles. 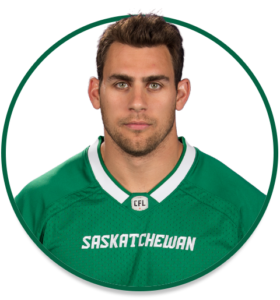 COLLEGE: Played three seasons at the University of Regina (2010-12)…was team’s long snapper but also played linebacker…played 23 career collegiate games…totaled 34.5 tackles and a blocked punt.